Hack a power drill into a mini metal lathe with precision speed control. I used a couple of broken power tools for the drive components in this mini lathe. It features a powerful motor and small size. The speed control hack is shown in step 5. The video shows a functional speed test of the lathe. There is a vibration from the motor coupling which is quite evident as the speed increases. I have added another video in the more tweaks step. I am starting to think that I need a laser etcher to make a micrometer tool holder for the next round of tweaks. There are some specialized items needed for this Instructable. The base materials are from Bosch Rexroth. The extruded aluminum base, t-nuts, inside brackets, end caps are all Bosch Rexroth. The extruded member is 45X90 and 14 inches long. The Skate bearings are form VXB.COM Part Number 608ZZ. Yes I know that these are not taper bearings (ideal choice) but they do work for this application. The rest of the materials are presented as needed in the instructions. The shaft support blocks have an ID of ¾ inch, You will need to bore/Drill to 7/8 inch for the skate bearings. This was done gradually with increasing size drill bits and a hand drill. The tailpiece support is a ½ inch counter bore bit that will be running in reverse. The shaft on the bit is ¼ inch and a copper tubing adapter was used to increase the size to 5/16 inch for the inner race of the bearing. This is a friction fit shaft and you are done this piece. The drive side is a flex coupler mated to a 5/16 inch rod. The flex coupler was threaded to accept the rod then two hex nuts are placed on the shaft for spacing. You may need to add a spacer washed for clearance. The shaft is then fed through the bearing and the assembly is clamped down with a nylon lock nut. The assembly should be snug but not binding. Install 2 inside supports and set the drive side bearing side on the base. This is to mark the position of the drive motor. I used 10-24 counter bore screws to allow for minor adjustment instead of the metric bolts needed for attachment of the angle supports. The motor mount was marked and drilled with a 3/8 inch hole then fastened loosely to the inner angle supports.The motor shaft was smaller than the drive coupler so I had to build up the shaft diameter with aluminum foil tape. The drive spider is now installed and the drive bearing assembly is placed then tightened securely. The motor is aligned and fastened securely. Place the tailpiece support and snug the bolts into place. I placed 2 additional angle supports between the bearing blocks for use as a tool rest. You can finish the base with end caps if you desire. Now is the time to make a 3-Jaw Chuck a 4 Jaw Chuck is shown in my pocket lathe Instructable. You will need to know how to braze or weld. Begin by selecting a ¼ inch fender washer. This is the base plate for the chuck. You will now need a 5/16 inch nut and a set screw that is ½ inch long. Place the set screw into the nut so that the bevel is protruding enough to center the nut in the ¼ inch hole of the fender washer. The nut should sit flat on the washer and not move about the hole. Braze the nut in place. The remove the set screw and flip the assembly over. Place a ½ inch hex nut in the exact center of the washer and equally space three 5/16 hex nuts around the perimeter of the ½ inch hex nut. Braze the 5/16 inch hex nuts in place and remove the ½ inch hex nut. Remove any slag with a wire brush and finish as desired. I chose to prime and paint flat black. I highly recommend a speed control for this motor. It rotates insanely fast and if operated without a guard will represent a safety hazard. You will need the trigger assembly from a cordless power tool. Preferably not a Li-Ion type as these can be fiddly to work with due to the safety circuitry inside of the switch. I used some scrap materials to quickly put together a clamping mechanism as shown, in a pinch a c-clamp will work for this. The drill that I used had a blown motor but the switch was still good. Since this was a Li-Ion type tool there is control circuitry in the switch. The fine wires shown on the inside of the larger wires are for that control circuitry. I placed the battery mating plug onto the battery and determined that the control circuit is 3.6V in reverse polarity. That means that you will need a small Li-Ion battery connected red to negative and black to positive for this switch to work. The switch is hand held and squeezed to adjust power as needed. The switch has a direction lever and if your motor is running clockwise the chuck will not stay on the threaded shaft so reversing the direction will correct this. Run the motor so that the chuck is tightened onto the shaft by rotational force. I put a quick jig together to allow for setting the speed at a desired level then having your hands free. I used a small section of the Bosch tubing and some 5/6 inch bolts. The switch was taped to the tubing and a lever was brazed together from scrap pieces. The adjustment is accomplished with a 5/6 inch threaded rod joiner, Tightening the joiner squeezes the trigger and increases the motor speed while loosening the joiner releases the trigger and the speed reduces. With no tension on the trigger the power stops. Previously I hacked a motion sensor for a switch, the main control board had a 3.6 Li-Ion cell as a backup source. I used this to trick the switch into working. Now when the power supply is attached the switch gives variable power to the motor to control the speed. The power supply inlet wires go to the bottom of the trigger as do the control circuitry wires. The motor is directly connected to the terminals at the top of the trigger. I wanted to use a 12V supply for this project but needed one that was in excess of 10A. I connected two 5Volt supplies in series to accomplish this. The supplies allow for adjustment in output VIA a small pot. I got 11V with what I had. Yes it will run on the battery but only for about 20 minutes of continuous use will deplete it. You might want to place a safety guard over the rotating motor and shafts for safety. I used metal files and HSS cutting tools to work the aluminum. This was done at a fairly low speed dry. The tool rest in from of the workpiece is a 1/4-20 bolt. The motor coupling that I used was horribly our of balance and I had to clamp the lathe to the workbench with a C-Clamp. I am currently working on a better tool holder for more accurate cuts. This is a long step with lots of pictures. You will need a 5 inch long piece of steel 1 inch by 1/8 inch bar stock. as a base. You can use a slightly longer piece if you have it and I will explain this part later. You will need 2 6 inch 5/16 bolts and a 8 inch 5/16 bolt that is threaded the full length. You will also need 11 5/16 nuts. Begin by drilling out 8 of the nuts with a 5/16 bit to remove the threads. Grind one flat on 4 of the drilled nuts slightly. place 3 of the drilled nuts on the 6 inch bolts then thread on a regular nut fully. Place 2 of the drilled nuts on 8 inch bolt. Lay the bolts as shown on the steel bar stock and braze the 6 end nuts to the steel bar. the alignment of the bolts is critical at must be as parallel as possible. make sure that the ground part of the 2 center nuts on the 6 inch bolts is facing toward the plate. Do not braze the 4 drilled nuts on the 6 inch bolts as these need to move freely, these will be called slide nuts later. Remove the 8 inch bolt. place this small plate nut side down in the center of the previously brazed piece then feed the 8 inch bolt back into the piece threading it through the nut on the smaller piece. make sure that extended threads of the center bolt are towards the right. This is critical for use later. Position the upper piece in the center of the 6 inch bolts then move the slide nuts to the corners of the 1 inch piece and carefully braze them to the 1 inch plate making sure that they do not get brazed to the bolts. Test that the small plate moves freely along the 5/16 slide bolts. It may be a little tight but it will work in and move freely as long as your slide bolts are parallel. You may have to tap the center bolt with a hammer to break any slag off of the bolts. The heads of the 6 inch bolts were not brazed in place to allow for a little play if the slide bolts were not completely parallel. Cut the ends off of the 6 inch bolts but not the 8 inch bolt. The 8 inch bolt is an adjuster bolt. This whole process needs to be repeated using 1/4 inch bolts. You will need 6 slide nuts, two 2 1/4 inch bolts and one 3 inch bolt that is threaded the whole way. Make the 1/4 inch slide nuts the same way as before using a 1/4 inch drill bit. Grind one flat on 4 of the drilled nuts slightly. place 2 slide nuts on each 2 1/4 inch bolt and thread a regular nut the whole way on. Align the bolts on the upper plate at a right angle to the 5/16 inch slides. Make sure that the slide nuts have the ground flat facing downward. Carefully braze the 6 end nuts in place leaving the slide nuts free. Remove the center bolt and grind the head round. Cut the slide bolts off flush to the brazed nuts. Place a threaded nut on the center between the 1/4 inch slides. thread the center bolt through the nut with the threads extending towards you with the lower adjuster bolt towards the right.. this is your upper adjuster bolt. Take a small piece of the bar stock that is as long as the slide bolts, this is the upper plate. Drill and counter bore the exact center of the upper plate. Place the plate on the center of the upper slide. Align the slide nuts so that they are about 1/4 inch apart in along the center of the upper plate edge. Braze the center nut through eh counter bore hole. Make sure that is is brazed in place and the threaded adjuster moves freely. Then braze the slide nuts in place. Test for freedom of operation. Finish the upper plate bu brazing 4 small headed 10-24 1 inch bolts to the corners, threaded side up. The clamp is a small piece of aluminum that has 4 holes drilled in the top. This is held in place with standard 10-24 nuts. The tool is clamped in place between the upper plate and the upper clamp. The adjuster bolts will need to be locked in place firmly but not binding. I used a lock nut and threaded rod joiner for the lower adjuster. This was drilled and pinned in place. I did not have a roll pin so I used a small nail cut and peened in place. The upper adjuster had 3 standard nuts installed on the threads then brazed in place. As a final step I brazed 4 fender washers to the bottom plate for clamping to the lathe. It is held in place with standard t-nuts. Due to the height of the tool holder I had to adjust the height of the motor by drilling new holes for the mount. Then I had to increase the height of the Drive bearing blocks bu placing a 1/4 inch shim of aluminum under the support blocks. More importantly I removed the foil tape from the motor shaft an pressed a small section of 1/4 inch copper Tubing onto the shaft then I used the new tool holder of machine the tubing to an exact fit for the motor coupling which greatly reduce the vibrations. Note the cutting tool looks like it is on upside down, This was done due to the lack of stores being open at 4AM. The cutting tool was too thick to meet the shaft properly so it was installed upside down and the motor was run in reverse to get a proper cut. I have made some updates to the mini lathe since the first one was posted. Unfortunately the pretty have been knocked off of it. While the first one was functioning fine I wanted to improve the operation. I have added a second bearing on the main shaft along with soft clamping jaws on the chuck. The motor coupling still is producing some vibration. what are the RPM of this 12 volt dc motor . The design of the chuck you fabricated is simultaneously simple and very clever. I will be incorporating this into a coil winding machine that will be stepper motor driven with a separate stepper for the lead screw. Good Instructable, certainly one I shall be looking at attempting. I have a concern about the voltage supplies. You are using 2x main voltage power sources for your project and these are showing exposed circuitry without protective covers. I think it may be prudent to advise readers that this is inherently dangerous and all precautions need to be taken to avoid electrocution. I recommend using fully enclosed Power Supplies (preferably a single 12v power supply) or at least get a qualified electrician to check your system before turning these on. For reference, in Australia it is illegal to have this kind of mains set up and turn it on without first having it checked by a qualified electrician, and it must have the cover affixed. I certainly love creating mechanical and electrical projects, but not at the cost of safety. Is there any chance i could get a list of all the parts you used to make this and maybe the links to the websites to order the parts? I have a Sherline headstock with motor and the column for the Sherline mill... but no way to mount the headstock to the column and nothing to mount the column to. Now turn it into a mill. Ready, Set.... GO! I was thinking of threading the shaft and using something like a rod coupling to extend the shaft. or using this lathe to machine a new shaft... actually if you look hard enough and I was that important to have less viabrations, im sure there are other motors with longer shafts out there or maybe instead of direct drive you can use a gear box or just make a gear drive like they have on the little mini bench top lathes. This is a great project as it is though. I was thinking about welding the rod on wile the motor is spinning around at about 5 RPM doing very quick heat ups as to not damage the motors interior. If the shaft is spinning around, it is more likely to be flush with the end of the shaft. You will have to sand the new shaft down to size if you solder it to. That is an interesting idea... I'm not sure but the heat from that operation could possibly damage the sintered bushings of motor windings. Since I first published this there are motor couplings now available that offer a balanced operation. try SPD-SI website. Whatever anyone tells you, THIS PAGE here, is something a mechanical engineer and designer would be proud of! Congrats on your epic tool rest! Thanks. Sometimes ideas come into my head fully formed and all I have to do is assemble the parts. This was definitely one of those moments. do you have any pictures of the stuff you made with the lathe? 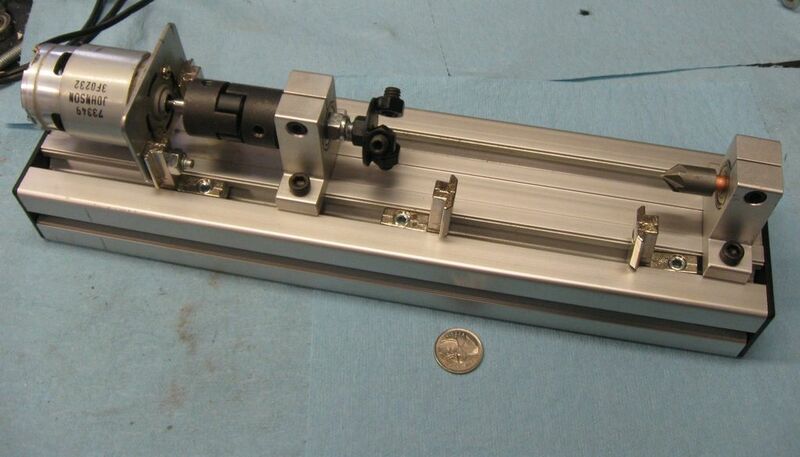 How would you compare it to commecial min lathes?